Have you ever been stitching along, and suddenly you realize that the fabric in your hoop has loosened and the tension is no longer even? Some hoops prevent this better than others, but even a basic wooden hoop can hold your fabric evenly if you add a binding. Some stitchers customize the outside of their hoops with some wrapping for decorative purposes (think of it as painting hoops, but with fabric! ), but binding a hoop is like doing the same thing with a hidden purpose. You may have seen hoops that have binding on them and wondered why one or both pieces of the hoop have a wrapping. Keeping even tension is one reason why, but another benefit is that the binding helps cushion the embroidery fabric and minimizes damaging creases. The cushioning is helpful when you need to move your hoop around on a larger piece and the hoop will go over completed stitches. In these situations, wrapping both hoops is usually a good idea. 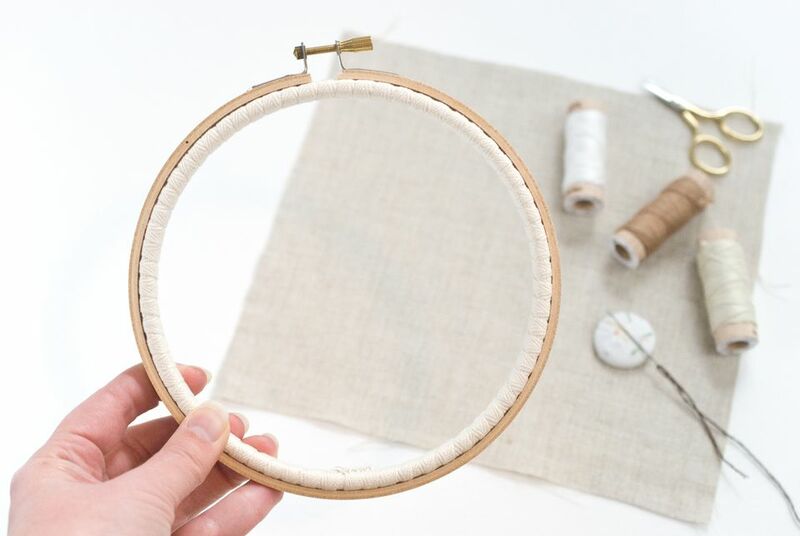 While many stitchers choose to buy more expensive hoops to keep their fabric held tightly, it's good to have a fast and easy way to make a simple wood hoop into a better-functioning tool. Not to mention, it brings new life to vintage hoops, making them suitable for framing embroidery and keeping your work held in place. There are a few options to work with when binding a hoop. All should be available at your local sewing or craft supply store. Twill Tape - This material is ​shown above and comes in different widths and thicknesses. You can buy it in packages, on spools, or by the yard. Bias Tape - Designed for dressmaking, this option wraps easily around curves because the fabric is cut on a bias or diagonally. Bias tape also comes in different widths and is thinner than most twill tape. Fabric Strips - Just like it sounds, this is simply cutting fabric into narrow strips. For extra thickness, press the strips in half before wrapping. For larger or thick hoops, use 1in wide binding material and for smaller or thinner hoops, use 1/2-5/8in wide material. 100% cotton is best for a good grip. The amount needed will vary depending on the size of the hoop and the width of the binding material. The 6in hoop in this tutorial used just over two yards of 5/8in wide twill tape. Separate the two hoop pieces and set aside the outer hoop. Thread a needle with sewing thread and knot the end. Set it aside until the last step. Begin wrapping the inner hoop by placing the end of the tape or fabric on the inside edge at a bit of an angle. Hold this in place as you get the wrapping started. You can glue the end to the hoop or hold it with a clip, but it's usually unnecessary. Once the wrapping starts, it will overlap this loose end and keep it in place. If you are choosing the wrap the outer hoop too, the process for starting is the same. Just begin to one side of the tightening screw. Wrap the tape or fabric around the hoop, overlapping the previous wrap by about half each time. Keep the binding tight. Sometimes it may start to loosen or form lumps, but as long as you hold it as you work and watch for areas that need to be rewrapped, it will be fine. If this happens, unwrap it a bit and try again, getting the wrapping tighter and more even. It's also helpful to keep the wrapping material on a spool or in a bundle as you wrap. You will need to bring it through the center of the hoop many times and keep it from twisting. If you run out of the tape or fabric and need to start another piece, hold the wrapped end in place, then start wrapping with the next piece so that it overlaps and holds the end. If it isn't holding tightly, secure the ends as shown in the next step, then continue wrapping. When you reach the beginning of the binding, make sure you have enough of the wrapping material to completely cover the hoop with some overlap. Trim the excess off so the end is on the inside of the hoop and hold it firmly. Stitch the end down with the needle and thread. Make sure that the stitches catch the end of the tape or fabric AND the wrapped binding. If you're using twill tape, it's also important that the stitches are in far enough from the end so they don't pull through the woven fibers. Stitch back and forth across the end, then secure it with a knot. Your hoop is now ready to use. Hoop your fabric as you normally would, but be prepared to loosen the screw quite a bit, as the inner hoop is larger with the binding in place. If you choose to bind the outer hoop as well, you may need to use a longer tightening screw so that it will still connect. Once the binding is on your hoop, you shouldn't need to remove or replace it for a very long time, and your fabric will hold well for plenty of happy stitching!